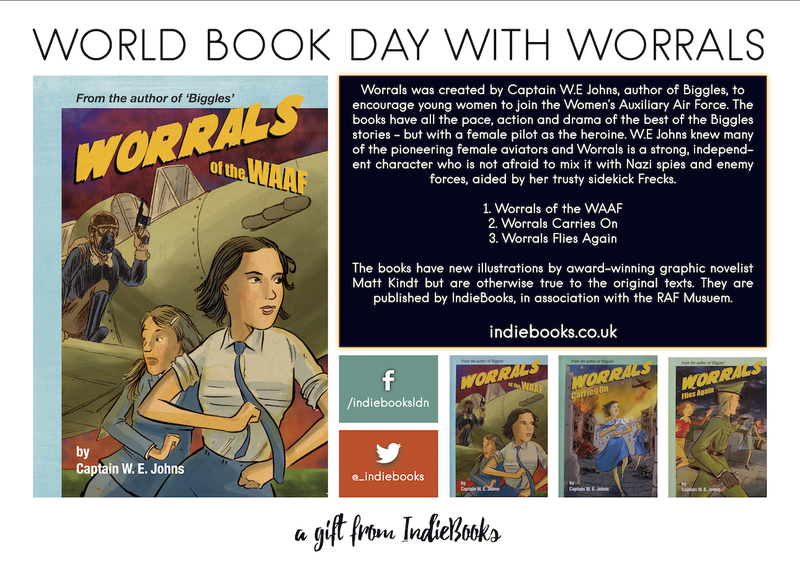 With a real lack of strong female characters in children’s fiction, we are choosing to celebrate International Women’s Day with Worrals, a character created by Captain W.E Johns to inspire and encourage women into aviation. Johns, who championed the role of women in aviation in ‘Popular Flying’ magazine, took the chance of an invitation by the Air Ministry to write about the Women’s Auxiliary Air Force to create a true feminist icon. In addition to Nazi spies, Worrals is also battling the chauvinism of the RAF ‘Top Brass’, who think girls have no place at the controls of an aeroplane. Get all 3 books in the series for £15 for today only! This year, World Book Day is marking its twentieth year anniversary. It is a joyous and animated celebration encouraging children to read. Across not only the UK, but the globe, children and adults alike will take part in a variety events proclaiming their love of a good read. From dress-as-your-favourite-character parties and putting on plays to story-time and craft workshops, World Book Day hopes to get a book in the hands of as many children as possible. Here at IndieBooks, we’re joining in on the fun. Already this week, we’ve been sending out free copies of Why Willows Weep to many of our loyal customers.Tomorrow, we’ll be out on the streets handing out free hardbacks of Worrals of the WAAF and A Young Person’s Guide to the Gothic. Fancy a copy yourself? As Worrals of the WAAF is published in conjunction with the Royal Air Force, try heading to the RAF Museum to snag one – they’ll be handing out books to some lucky museum-goers tomorrow. Won’t be up that way? Well, you might just find a few hidden around the coffee shops near Chancery Lane or spot us up ’round the British Museum. We’ve got towering stacks to give away! Check our Twitter feed tomorrow if you want to stay in the loop or feel free to tweet us if you want to track us down.